All songs by Donovan P. Leitch, except 03 & 05 by Buffy Sainte-Marie. Tracks 07, 08, 09 & 10 recorded live on November 17, 1967, at the Anaheim Convention Center, Los Angeles, CA. All songs by Donovan P. Leitch, except 02 music by Donovan P. Leitch, words by W.B. Yeats, tracks 04, 05, 08, 09 & 10 traditional arranged by Donovan P. Leitch. Tracks 08, 09 & 10 recorded live on November 15, 1971, at the J.F.K. Center. Tracks 13 & 14 recorded live in Japan in March 1973, and released only in Japan on the album Live In Japan: Spring Tour 1973. There Is An Ocean: a home-made video of Donovan, family and friends from Open Road band, sailing through the Greek Isles, directed by Nigel Lesmoir. Previously Unreleased. · Try For The Sun: The Journey Of Donovan is the second CD Box Set for Donovan and was released 13 years after the Troubadour: The Definitive Collection 1964-1976 CD Box Set. 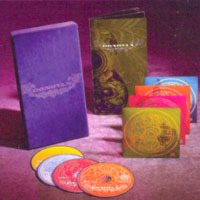 It contains three compact discs, one DVD and a 56-pages booklet. All harmoniously placed inside a beautiful violet velvet box. · Apart from including most Donovan's charting singles, there are some precious gems for fans, never released before, like some live recordings from 1971 and tracks previously included in the rare album Live in Japan: Spring Tour 1973, only released in Japan and very hard to find nowadays. · The 56-pages booklet starts with an introduction by Donovan (2005), liner notes by Anthony DeCurtis (NY city, May 2005), and a lot of quotes about Donovan by several artists: Graham Nash, Joan Baez, John Mellencamp, Stephen King, Alice Cooper, Mary Chapin Carpenter, Tim DeLaughter (The Polyphonie Spree), Rickie Lee Jones, Nancy Wilson, Devandra Banhart, Billy Corgan, Al Kooper, Jimmy Page, Stephen Merritt (Magnetic Fields), Warren Haynes (The Allman Brothers Band), Suzi Quatro and James Mercer (The Shins). · The bonus DVD, There Is An Ocean, shows a young Donovan enjoying and playing with the Open Road band through the Greek Isles. It was probably filmed before he went off to tour solo in Japan. Donovan himself tells in his autobiography The Hurdy Gurdy Man that by then he was falling into a big depression, although he doesn't look sad in the film. There are a few songs not appearing anywhere else, besides some live versions of songs from the albums Open Road, HMS Donovan and Essence To Essence, that hadn't been released by the time the film was made. · The songs Moon In Capricorn, The Ferryman's Daughter, She Moved Through The Fair and The Travelling People were supposed to be part of an unreleased album called Moon In Capricorn, that should had been released before the Barabajagal album. · The Swan (Lord Of The Reedy River) is listed as Lord Of The Reedy River although it's the demo version that appeared as a bonus track in the 2005 reissue for the Barabajagal album. It is marked as previously unreleased, but it was included in this reissue released five months before this box set was out. · Lalena is listed as Lalena. · Barabajagal is listed as Barabajagal (Love Is Hot) [with the Jeff Beck Group].